Derek Perks as Richard Roma (left) knows the sound of a brand new Cadillac fading away into the distance with Chris Coculuzzi as John Williamson (centre) paying the price for loose lips. Frank De Francesco as Detective Baylen (right) wants answers from all the usual suspects in a case he refuses to let slip away. 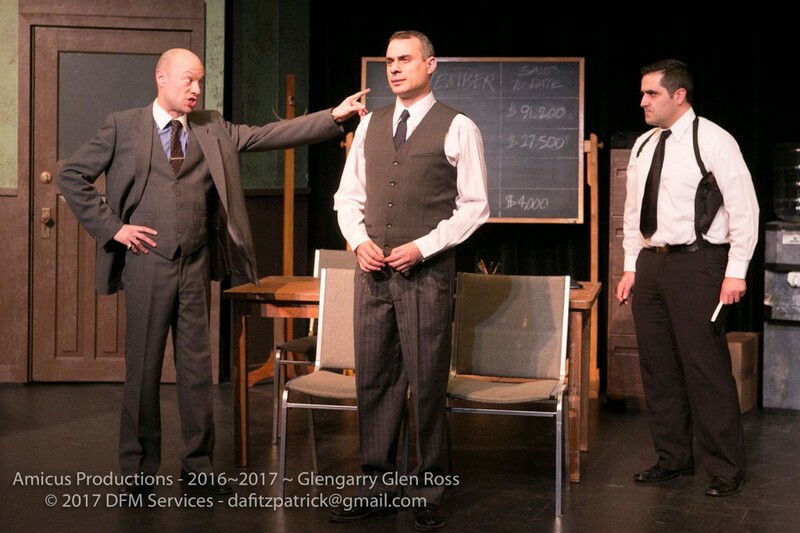 If bad luck does indeed runs in streaks, you can thank Amicus Theatre for turning the tide this month with its dramatically seething presentation of Glengarry Glen Ross. Not only is it the closest rendition of the film you’ll likely experience, it’s wondrously indicative of what it takes to close the biggest deal on stage! We have to thank playwright David Mamet for his palpable vision of the dog eat dog world in which we live brimming with sweet talkers, fabulous foolers, and the downright naïve. However, this isn’t supposed to be a story that any theatre company can just comfortably wade into. Director Harvey Levkoe makes a brilliant decision to follow the behavioural patterns and rant rhythms of the 1992 cinematic masterpiece so not a single scene falls short of expectations. For those that never took a deep dive into the nightmarish sales competition plotline involving four cold calling real estate pushers dying to get their hands on the Glengarry premium leads, there’s lots to emotional room to roam in this observation of old school tactics in an evolving world of consumer science. Master influencers Daryn Dewalt and Derek Perks work pitches like it was their birthright to do so with Neil Hicks making a heist concoction look like an Olympic sport. This leaves Jerrold Karch scrambling for disassociation with Chris Coculuzzi on the prowl for answers that everyone tries hard to evade. The seductive presentation unquestionably paves a path into the headspace of theses lovable persuasion pimps a bit differently than what the Hollywood icons pulled off on the big screen which says so much about the power of a live theatre. Whether you’ll admit it or not, life is undoubtedly all about getting on the metaphorical big board and the craft in doing so—as noted in the final scene—is admirable from any vantage point. Desperation and paranoia has never tasted so sweet at The Papermill Theatre. Missing this one is like missing your Lotto 6/49 jackpot prize. It’s not just sad, it should be illegal.